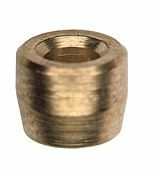 Most of our Goodridge adaptors, clutch and brake line fittings are available in either plated steel (P), stainless steel (C) or aluminium (D). Our clutch/brake hose is suitable to be used with brake or clutch fluid and is suitable to be used with these Goodridge clutch and brake line fittings. Most female Goodridge adaptors are also available in either concave or convex seats. Concave are the type of seat with goes inside of the fitting itself whilst Convex seat protrude out from the fitting.